The Earth provides not one but many examples of a habitable and inhabited planet. Understanding Earth's atmospheric evolution and its relationships to biological evolution is essential to recognizing the atmospheric fingerprints of life elsewhere. Could life be hiding in plain sight? Atmospheric oxygen may provide a major clue to the presence of life on an exoplanet, but advances in our understanding of Earth's oxygenation history show us that finding life may be more complicated than we anticipate. 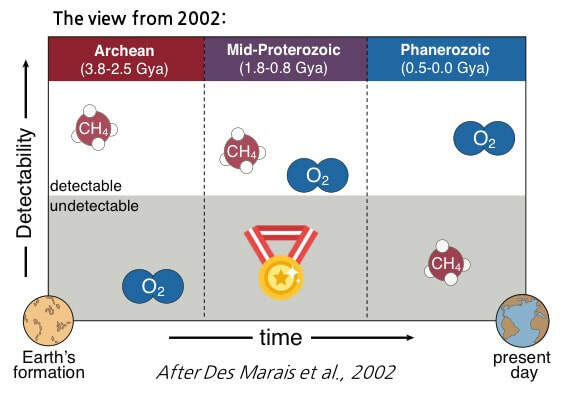 Previously, we thought that the mid-Proterozoic atmosphere was sufficiently oxygenated that oxygen would have been a viable biosignature for a remote observer viewing Earth--but not so oxygenated to preclude high levels of biologically produced methane. 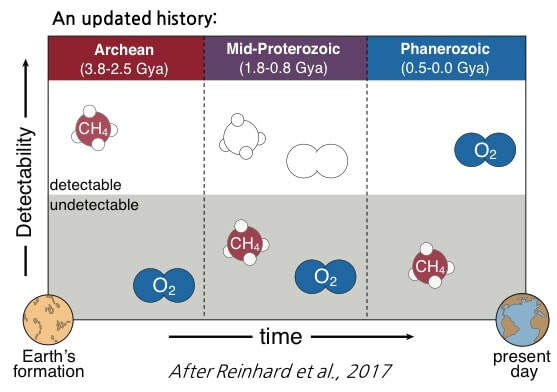 It turns out that we were wrong about both gases: neither oxygen nor methane was abundant in Earth's mid-Proterozoic atmosphere. Moreover, our 'gold standard' biosignature for Earth-like exoplanets (oxygen and methane co-existence) has never been remotely characterizable in Earth's own atmosphere! A major challenge moving forward--and a focus of my own research--will be identifying potential biosignatures for Proterozoic-like biospheres. As it stands, we are not yet prepared to recognize the full diversity of Earth-like biospheres. These results illustrate the merit of a 'mission to early Earth' in advance of upcoming design choices for the next generation of space-based telescopes that will define our search for life for decades to come. For more information, see: Reinhard, Olson, et al. (2017) Astrobiology. How can we distinguish between biological and geological methane? Methane is a popular biosignature for Archean-like planets. Although Earth's atmospheric methane is overwhelmingly biogenic, geological sources for methane exist and may sound a false alarm for life on an exoplanet. Fortunately, the chemical disequilibrium implied by the co-existence of carbon dioxide (carbon in its most oxidized form) and methane (carbon in its most reduced form) might confirm a biological methane source because this combination is unexpected on a sterile planet. Seasonality in methane abundance may increase our confidence further. Methane seasonality in Earth's atmosphere is primarily photochemical (enhanced evaporation in the summer drives greater photochemical destruction of methane)--but the repeated recovery of methane requires an active source of methane from the surface. This signal thus tells us that carbon dioxide and methane disequilibrium is unlikely to be the consequence of a stochastic event (e.g., methane delivery via major impact) and hints at the operation of a hydrologic cycle (habitability). Atmospheric seasonality: the pulse of the biosphere? Spectral 'snapshots' of transiting exoplanets may not reveal life as readily as we had hoped. Fortunately, future direct imaging missions will allow us to do better by allowing access to a planet throughout its orbital period. Characterizing seasonal variability in atmospheric composition might allow us to track changes in biological activity as light and temperature conditions at a planets surface evolve seasonally. This variability generates a striking sawtooth pattern in carbon dioxide and oxygen levels in Earth's atmosphere thanks to a shifting balance of photosynthesis (which draws down carbon dioxide and produces oxygen) and respiration (which consumes oxygen and releases carbon dioxide back to the atmosphere). Although the resulting oxygen oscillation is small compared to today's high oxygen levels, these changes may have been comparatively large on a low-oxygen early Earth. We have shown that seasonal changes in oxygen might even be diagnosed through ozone oscillations--even when oxygen itself would be challenging to identify spectrally. Ozone levels are very sensitive to oxygen levels (A). Very small changes in oxygen might be characterizable through impacts on ozone (B), even if oxygen itself is not detectable (C). In B and C, the purple line corresponds to modern oxygen levels and the black line represents an anoxic atmosphere. The red and blue lines bracket a possible Proterozoic seasonality scenario. For more information: Olson et al. (2018) Astrophysical Journal Letters.